October 18 — La Crosse Promise is pleased to announce that the first family to renovate their home as part of the Neighborhood Revitalization Program, has completed their project and is now eligible for $50,000 in scholarship funding for college. Mike and Nancy Caucutt participated in the program to earn scholarships for two of their children, who will receive $25,000 each when they graduate from high school and enroll in college. The Caucutts were pioneers of the program which launched in 2015. 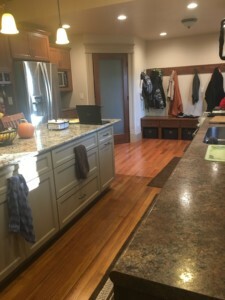 The majority of the renovation included an addition to their Queen Anne-style historic home in the Washburn Neighborhood as well as a new, updated kitchen (left).